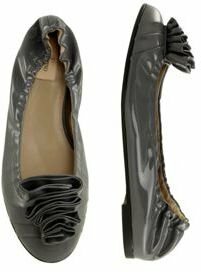 These gorgeous Valentino Ruffled Ballet Flats cost $495 at Marissa Collections. Get a similar look for less with these Ruffled Flats from Spiegel, which come in three colors and cost $39. A stylish work-to-happy-hour option. This Of Two Minds Lace Sweat Shirt combines the elegance of lace with the relaxed, casual comfort of your favorite sweatshirt. Click the image to purchase for $242 at shopbop.com. This Kimchi Blue Lace Back French Terry Pullover features a lace back rather than all-over-lace, but it's a great look for less at just $38. Click the link or image for shopping details! UPDATE 3/31/10: Never heard from our first winner so we had to pick another, and that lucky reader is… #103 Charli! Congrats to our winner and thanks to Mimi Boutique for making this fab giveaway possible. Please note: This giveaway has ended. Today is not only St. Patrick's Day, it's also The Budget Babe's 3-Year Anniversary! To celebrate, I've teamed up with chic boutiques around the web to bring you fun giveaways each day this week. Thanks to Mimi Boutique, a fab source for designer-inspired bags, accessories, jewelry and more, I'm happy to offer this 'Lindsey' Green Hobo Bag (valued at $62) to one lucky reader! This stylish bag comes in a vivid green shade reminiscent of the Emerald Isle and it just so happens to be one of the hottest bag trends for spring. Comments must be posted by Wednesday March 24th at 12 noon to be eligible to win. This giveaway is open to US residents only. Good luck!! Going on right now, Lauren by Ralph Lauren is hosting their first-ever online fashion show for their Spring 2010 collection. Hear commentary from top fashion editors and shop the looks instantly by selecting and purchasing the styles directly as the models walk the runway. Some say this is the future of fashion shows, and while I'd miss the real-life experience, it's amazing to see access extended to anyone with a computer and internet access! Watch the teaser video above for a taste or go directly to http://www.ralphlauren.com/Lauren to see the show.